Understanding how to train horses effectively and sympathetically requires appreciation of the whole picture: rider posture as well as application of the aids. 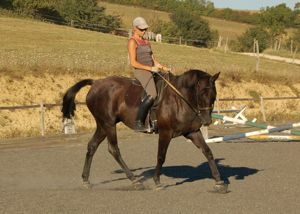 How to train horses is a subject which can only be understood fully as a two way relationship between rider and horse. This seems obvious at first glance, but, as scientists often attempt in their experiments, many riders try to remove themselves from the equation. It is because of this that it can be thought that horses responses to our aids are random, and only by reinforcing the 'right' response, can we train successfully. In scientific experimentation on the subject of training horses: A Review of Learning Behavior in Horses and its Application in Horse Training by C. A. McCall it has been concluded that horses learn by a chain of STIMULUS-RESPONSE-REINFORCEMENT. The stimulus being an aid applied by the rider, to which the horse responds (randomly) and if the rider is happy with this response he/she will praise and reward in some way (positive reinforcement). If the horse's random response is not acceptable to the rider then either the rider can ignore this until the required response is made, or continue to apply the same stimulus (aid) until the required response is made, (negative reinforcement). 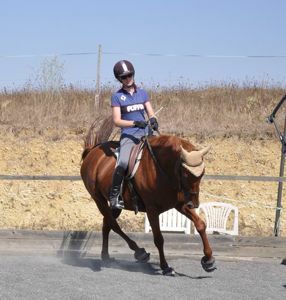 the application of stimuli only when the horse is able to respond - the example given being that aids for lateral movement must be given when the hind limb which is being asked to cross over is off the ground. Interestingly this report states that "When a horse is learning a new response, it makes many incorrect, and often annoying, responses"
This kind of value judgment in a research article is as incongruous as the findings. Unfortunately the findings do reflect the standard of much of the training that horses are subjected to in all areas of horsemanship, and the results are as one dimensional and misconceived as the logic presented. If the techniques for how to train horses were circus entertainment, the ideas above would be perfectly acceptable. 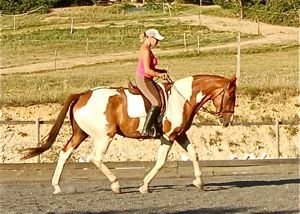 So what is the difference between true dressage and this kind of training? To sum it up in one sentence, when we train a horse, we are not eliciting a series of particular individual 'responses' from a horse, we are creating a living machine which is formed by two separate athletes, each one in perfect balance and harmony of movement with the other, so that their separation becomes insignificant. Most people have a tendency to explain things in life in terms of their composition, rather than their structure. This could be because composition - the material make-up of something - is more apparent, and also more accessible than structure - the essential organization of any system. However looking at the dimension of composition is rarely the key to a profound comprehension of any subject. For example we often explain our health in terms of the symptoms of disease, rather than being aware of the state of our innate healing systems, and when it comes to how to train horses we tend to be more aware of the aiding system and its relevance, than the posture of both horse and rider. The reason that this will lead to faulty practices in horse training is the same reason that treating symptoms will not heal the source of an illness - it is the structure that determines reality. Structure is the truth which exists beyond time - the absolute. Whereas composition is material and ever-changing. It is form-based perception. For more on this philosophy look at the fascinating work of Masuro Emoto. Of course, if the goal is how to train horses to perform conditioned responses (tricks), then it is reasonable to focus only on the one dimensional 'learning responses' doctrine. It is a pity to go down this road though, because, far from empowering horse and rider, in fact it only produces a caricature of dressage. Why? because it doesn't address the bio-mechanical functioning of horse or rider. The structure of true dressage is the improvement and amplification of any horse's paces by means of gradual and consistent suppling of virtually all of the joints of the horse's body in order that the horse can move straight and engage its postural ring (see What does 'on the bit' really mean?. 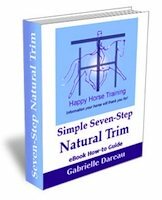 The only way to achieve this is by gradually and consistently suppling your joints, as a rider, in order that you can be straight in the saddle and channel the horse's energetic movement straight, through you, as a result of your postural control. 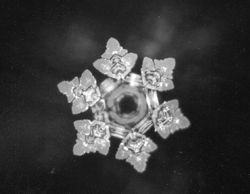 A water crystal shows the beauty of harmonious structure. Homeopathy is an example of a healing art which uses the structure of water as a means of carrying information, accessing the body's healing intelligence on a much more profound level than pharmaceutical drugs, which come from a composition-based mind-set. How to Train Horses: How does it all fit together? We are living in a time based reality, so composition does have a place, a bit like the lines joining up the dots. Thinking about how to train horses, ultimately we want the horse to be developed enough to carry himself comfortably in balance with the rider, so that the intention of rider and horse is aligned to the point of becoming a communal mind, and aids become less and less necessary. This is the state of absolute connection. This doesn't happen straightaway however, and the aiding system is very important. 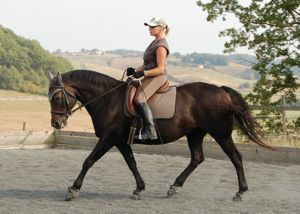 The primary function of the aids is to heighten the horse's awareness of the riders posture. The riders posture is not static, every moment it is reacting and readjusting to the horse's longitudinal balance and lateral straightness, and simultaneously promoting the maximum possible degree of each. 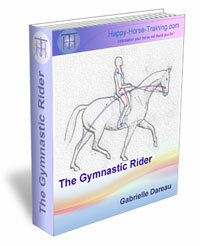 During this flow, the aids are how the rider communicates the postural adjustments he or she is making. As the horse becomes more physically capable through gymnastic development, his heightened sensitivity allows aids to be reduced to a minimum. 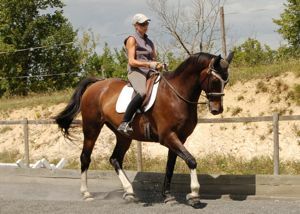 A horse with such sensitivity is almost part of the riders leg, and the physical connection easily produces a subtle, electric-type frisson. This is nothing like the brutal spur jabbing which can be witnessed commonly in competition dressage arenas, and neither is it the dull stuffiness of a horse dead to the leg because they have never been trained to go forward properly. How to Train Horses: Why Does It Matter? How to train horses is, in fact, not a simple subject, which is why many riders run into difficulty somewhere along the line. Sometimes because they don't conceive fully of the influence of the riders posture on the horse's posture (100%), or they maybe come up against a physical problem in themselves, for example lower back damage, and can't find a way to resolve it, or the effort of so many years of training doesn't seem to be worth it when focusing on the horse is so much more accessible. Like buying a hamburger rather than cooking a sophisticated meal. It matters because hamburgers seem like a good idea at the time - they are convenient and appealing in a certain way, but they appeal to our lesser self, and the resulting indigestion and guilty/unsatisfied feeling is not an uplifting experience! Appreciation of the whole picture of real dressage is so fulfilling that even a moment of that magical feeling of channelling between horse and rider, when both energy flows merge and the 'machine' of engagement is generated, is worth many more moments of effort and physical frustration alongside. Training horses is not a mysterious process, because engagement is a gymnastic fact which is sadly unrecognized in many circles, including in the scientific research mentioned above. It remains unrecognized simply because the rider's full role is not appreciated (the riders posture was not mentioned at all in the article) even though it is the bedrock of how to train horses. The fact that correct dressage riding, and subsequently how to train horses, is not a mystery, means that it is available to everyone who is willing to expend a bit of time and effort. It is not an exclusive club for people with long thin legs and expensive horses! but a means of forming a compassionate bond with a member of another species. Those magic moments are also available to everyone, whether a beginner or a practiced rider. 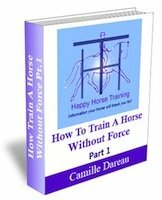 This philosophy of training horses is available as a practical method in HHT's eBook: How To Train A Horse Without Force.